Are you a fan of explosions, wacky physics, puzzles and taking down aliens? 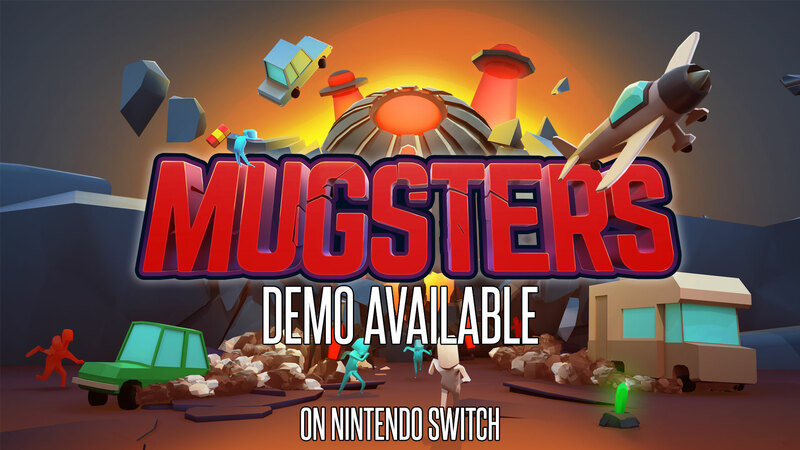 Check out the brand new Nintendo Switch demo available now for Mugsters, the action-puzzler by developer Reinkout. The world has been taken over by aliens and it is up to you to save your fellow humans and reclaim the planet. Run, drive, fly, blow up, fight and solve environmental puzzles on your way through the 6 single player and 6 local multi player levels of the brand new Mugsters demo for Nintendo Switch. Did you enjoy the Mugsters demo? Pick up the full game to enjoy 25 unique single player levels that challenge you to think outside the box. Play 25 local multiplayer levels where the original levels have all been remixed to create new and unique co-op challenges for you and a friend. Complete a level to gain access to the time trials, challenging you to complete levels as fast as possible. This lets you compete with other players around the world for the very best leaderboard times. Are you up to the challenge? Humanity depends on you! Mugsters is available on Steam, PlayStation 4, Xbox One and Nintendo Switch.